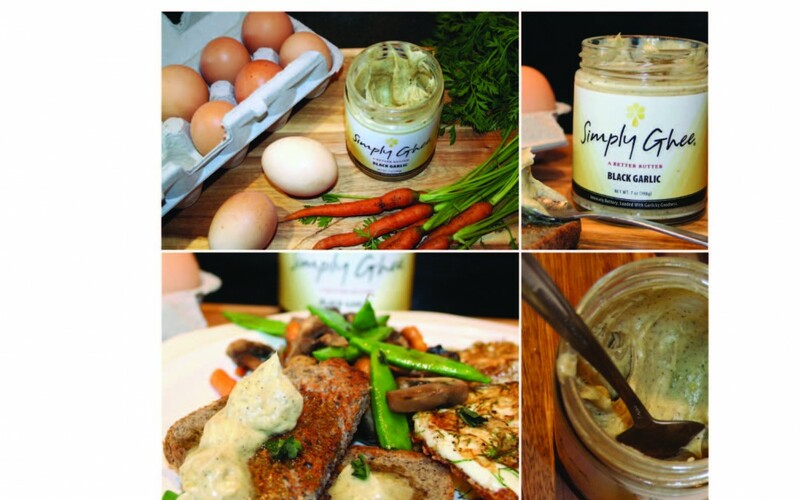 Have You Tried Simply Ghee Black Garlic Ghee Yet? I was told “You are going to want to lick the jar!” Well let me tell you…that was just the beginning! I received my Simply Ghee, Black Garlic flavor a few days ago. It took me about 10 seconds from when my package came through the door until I tried that lovely ghee. I should probably be honest with you at this point. I imagined myself putting it on so many things. I wanted to savor the jar and let out my inner foodie! I wanted to cook an absolutely blissful meal, try it on toast, on veggies, on pizza, fry an egg in it…I could go on. However when push came to shove, I whipped off the lid and stuck my finger into the jar. YES, I did. It was a moment where a grown woman lost control in the excitement of trying something new, and boy did it feel good! Now that I have confessed to you all, l must ask. Have you tried ghee yet? If your answer is no, you are missing out! I’m not new to ghee. It’s something I cook and bake with often and it has become one of my pantry staples. It is one of the few “dairy” products that I am able to use and boy am I thankful (so is my butter loving husband). Ghee is made by gently heating butter and removing the lactose (sugars) and the caseins (proteins). With the lactose and caseins removed only the rich golden oil remains. This oil contains the optimal ratio of Omega 3/Omega 6 and fat soluble vitamins A, D, E & K. I find that ghee has all the great flavor of butter with a texture similar to that of softened room temperature butter. Since the lactose and caseins are removed those that may have a hard time eating traditional dairy are sometimes able to tolerate ghee, such as myself. Whew! So what’s black garlic and why put it in ghee? As I understand it, black garlic is a fermented garlic. Through the fermentation process what was once raw and pungent garlic flavor becomes this wonderful mild savory garlic flavor. It almost has an ever so slightly sweet or molasses like tone to it. Black garlic also boasts double the antioxidants that traditional raw garlic holds. There is one more secret, I’ve read that black garlic won’t make you have that stinky garlic breath that raw garlic so often leaves behind. All this being said, am such a garlic lover and was just so excited about this new flavor. When I say garlic lover, I mean it. I put it into 50-70% of the meals that I prepare for my family. When Simply Ghee came out with the Black Garlic flavor, purchasing it to try was a no brainer for me. After tasting it, I would describe it as a nice mild garlic flavor whipped into this light and airy ghee with an accent of sea salt. Can you tell that I really love it? Mix that fabulous mild black garlic flavor and healthy antioxidants, with the wonderful nourishing tradition of ghee (made from grass fed butter as Simply Ghee is) and I don’t believe you can go wrong. It’s a great match! From now on when you peek into my pantry, you’ll spot at least one jar of Black Garlic Simply Ghee. I may actually need to keep one just for myself and one for guests. I can’t guarantee I, or another family member, won’t dip a finger into it again! If you like garlic, I’d recommend you pick up a jar of Simply Ghee Black Garlic. Cook with it and let me know if it unleashed your inner foodie or if you were like me and just couldn’t wait. Either way, go for it and enjoy!